Staff Sergeant Alexander Lavell was awarded many medals for his service in conflicts including the Second World War, Korean War, Malayan Emergency, and the Vietnam War. 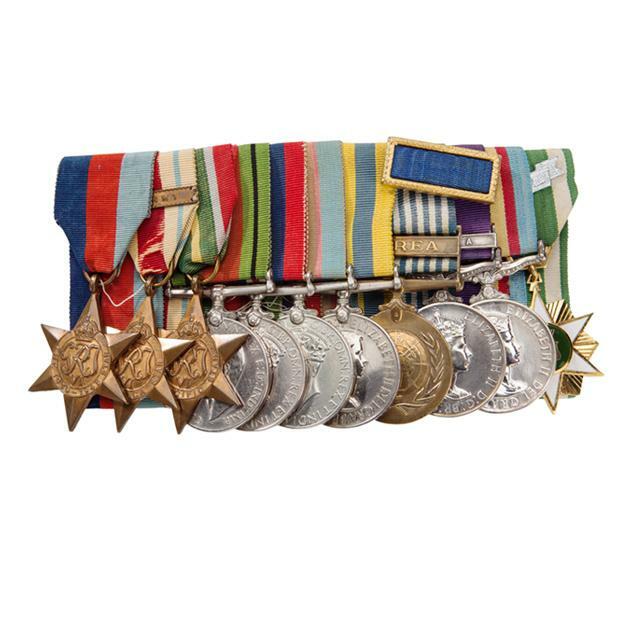 These medals are mounted as Lavell wore them during his final years in the Australian Army and at ceremonies after his discharge. The medals include: the 1939-45 Star; the Africa Star; the Pacific Star; the Defence Medal; the British War Medal; The Australian Service Medal; The Korea Medal; the United Nations Service Medal with bar "KOREA"; the General Service Medal (1918-64) with bar "MALAYA"; the Vietnam Medal and the South Vietnam Government Medal with clasp "1960-". Pinned above the Korean War medals is the blue ribbon brooch with gold boarder of the US Presidential Unit Citation (PUC). Lavell served with 3rd Battalion, the Royal Australian Regiment (3RAR), at the Battle of Kapyong in April 1951. 3RAR was awarded the PUC for this action and those who fought in the battle could wear the PUC on their uniform for the rest of their service career regardless of which unit that served with subsequently.